At first, there was nothing — complete and utter emptiness. Zero energy and zero matter. And then, out of this nothingness, the universe was born. Tiny, but extremely dense and packed with energy. And then, within a miniscule fraction of a second, it rapidly grew in size — inflated — by at least a factor of 10raised to the 25th power. Scientists hope that in just a few months they might start to unravel the riddle, when they examine the next set of data from the Planck satellite. Since 2009, this radio telescope, run by the European Space Agency (ESA), has been mapping the oldest light in the universe. Known as the Cosmic Microwave Background (CMB), this fossil light is often called the Big Bang's afterglow. It is thought to have appeared after the inflationary period, some 380,000 years after the universe was born, when neutral atoms started forming and space became transparent to light. When the first set of Planck data was released in March 2013, both "inflationists" and "anti-inflationists" felt vindicated. Supporters of the theory said the Planck results hinted perfectly at how inflation might have worked. Critics, however, argued that the inflation models were simply tweaked to fit the data, without really explaining it. All Planck data suggests that the universe is "remarkably simple," said astrophysicst Anna Ijjas of Harvard University. The same data, however, only supports inflation models that are highly complicated and, she said, "only work for much more restricted initial conditions." This image unveiled March 21, 2013, shows the cosmic microwave background (CMB) as observed by the European Space Agency's Planck space observatory. The CMB is a snapshot of the oldest light in our Universe, imprinted on the sky when the Universe was just 380 000 years old. It shows tiny temperature fluctuations that correspond to regions of slightly different densities, representing the seeds of all future structure: the stars and galaxies of today. Scientists hope that the next set of Planck data may show whether inflation is a plausible explanation for the shape of today's universe. 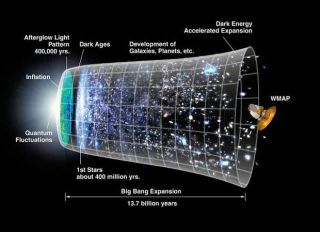 And supporters of the universe inflation theory say that it might prove that the seeds of today's universe can be found in quantum physics. These classical density fluctuations probably originated in tiny, spontaneous quantum fluctuations in the spacetime metric immediately after the Big Bang, said theoretical physicist Daniel Baumann of Cambridge University. "We believe that inflation stretched these small quantum fluctuations into [the] classical density fluctuations observed in today's universe." Since these classical fluctuations appeared right after inflation, that means they were already there when the CMB was created. And it's these density fluctuations that became the seeds of stars and galaxies. The oscillations found in the CMB provide another pointer toward inflation. When the CMB began to "glow," the quantum fluctuations had already become classical density waves. The first set of Planck spacecraft results not only confirmed these fluctuations, it also showed that they are correlated over huge distances: all waves with the same wavelength seem to be oscillating in sync with each other. "This coherence is something that inflation explains very naturally," said Baumann. "It is by far the most striking observation we have made. It's very tantalizing." One of the most startling results of all CMB measurements, though, has been the uniformity of the fossil light's temperature, which varies by less than 0.0003 degrees Celsius.There are only two ways that the universe could have achieved such uniform temperatures, Baumann said. In a non-inflationary model, there would have to be wild temperature differences between different parts of the universe, which then, over time, would have reached equilibrium, just like various objects in a house reach "room temperature." Inflation, says Baumann, offers a better solution: all matter initially had the same temperature and then was suddenly torn apart at an accelerated pace. So now there are tiny temperature variations among objects, because they all started out at the same place and with the same temperature. "It is like finding two cups of coffee [very far away from each other] with exactly the same temperature," said Baumann. "If they have never been close enough to exchange heat, there is no reason for them to have the same temperature." In an analogue to the inflation theory, both cups would be "produced by the same coffee machine at the same time, and inflation then takes the coffee cups and separates them faster than the speed of light." Studying the CMB's extremely faint light has been tricky throughout, but also full of scientific promise. That's because the quantum fluctuations at the start of the universe should also have triggered gravitational waves, elusive and so far theoretical ripples in spacetime predicted by Einstein. If they were to be found, and found to map to the CMB's fluctuations, they could provide extremely strong support of inflation. "Seeing gravitational waves would be a smoking gun" for the inflation model, said Baumann. The proof is complex, but it depends on subtle variations in the polarization of the light waves from the CMB. There are two types of polarization variations, called E-mode and B-mode. The latter describe the rotation, or twist, of the polarization, and it is this variation that physicists hope will provide weighty evidence for inflation. According to Einstein's general theory of relativity, the CMB would show B-mode polarization because of the huge energies involved in the stretching of spacetime during inflation, said Ijjas. If the CMB's light is indeed twisted that way, inflation would provide an excellent explanation, because "such a high-energy mechanism would shake space-time in a dramatic way, so that we could determine its strength by measuring the amplitude of gravitational waves it produced," said Ijjas. Baumann says that gravitational waves may even persuade scientists who are working on alternatives to inflation to accept the model. "Seeing B-modes would give us a lot of confidence that inflation happened and that we all came from quantum fluctuations." Ijjas agreed. "The main tendency has been [so far] to design complicated inflationary models with many parameters that match the Planck data," she said. "Detecting or not detecting the gravitational wave signal is a key test that can either improve or harm the case for inflation."